The delta Sco observation period for this year is nearly at the end (at least in West Europe). 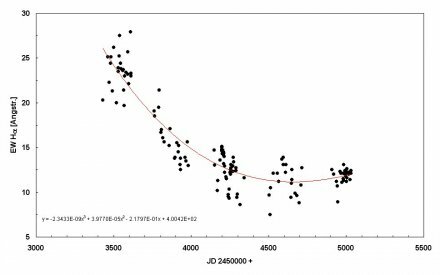 It seems, the time behavior of the Halpha-EW has reached a minimum at JD 2454650 and that there could be a trend reversal to a increasing EW (see attached plot). A strong argument for such a reversal could come from the line profiles itself. Because of that it could be meaningful, coming profiles to compare with the previously one. On the other hand a new increasing of the Halpha EW could also be triggered during the periastron passage in Feb./2011. Thus it make sense, to observe wide ranges of the spectrum of this star during this coming event, in order to see, how it will influence the profile of different other interesting lines and the Halpha EW. This effort could be a classical application for users of Echelle spectrographs and of course for spectrographs with flexible and adjustable measurement ranges. In addition also the triple structure of the HeI6678-emission needs further studies. There exists a thesis, that certain ionisation structure in different orbital phases could be responsible for this feature. Here we could contribute helpfully for clarifying this phenomenon. I would like suggest a common campaign in order to more cover this event as close as it possible with spectra. My possibilities are limited correspond on this requirements, so that a collaboration would be very welcome. The observation period should be at least on spectrum per week.